Paul’s passion for fishing, combined with his corporate background and over 20 years experience fishing out of Ucluelet and the West Coast of Vancouver Island, makes Paul the ideal guide for your incredible fishing charter. Your experience aboard Castaway Charters will be both relaxing and exhilarating as you reel in one fish after another! Ucluelet, BC is situated near the Barkley Sound, right next to the large undersea plateaus’ (Banks) just offshore that attracts spawning baitfish. This area is naturally stacked with both Halibut and Salmon, and they are ready to bite! The waters near Ucluelet are quickly building the reputation as one of Canada’s “World Class Fishing Destinations” and it is not uncommon to catch Tyee A Chinook Salmon over 30lbs in the peak summer months. Captain Paul knows where to find the fish, what tackle to use, and how to make the most out of your time on the water. Castaway Charters is located near the most consistent fishing grounds on the West Coast, and it is not uncommon that a full day 4-person trip could land you between 20 to 30 fish in one day! All trips depart with two 150-quart coolers lined with fresh salt ice to keep your catch fresh and the deck has a sea and fresh water wash down system so your fishing area is clean throughout your trip. Paul will bleed, rinse, clean, and filet your catch and repack it on new salt ice in your cooler. This service is included in your fishing charter package. There is also a vacuum packing processor that can vac pack and freeze your fish till you’re ready to head home. Paul Grimston has been fishing the waters off the West Coast of Vancouver Island for over 20 years. He has spent over 18 years in Ucluelet on board Castaway’s 32 foot sportfisher. Paul’s passion for fishing, combined with his corporate background, makes him the best choice for your guide. His extensive fishing experience will be proven by a cooler full of fresh fish that you’ll catch. Paul’s current record Halibut for 2009 was 141 pounds, the largest Halibut on the dock in 4 years – maybe more. 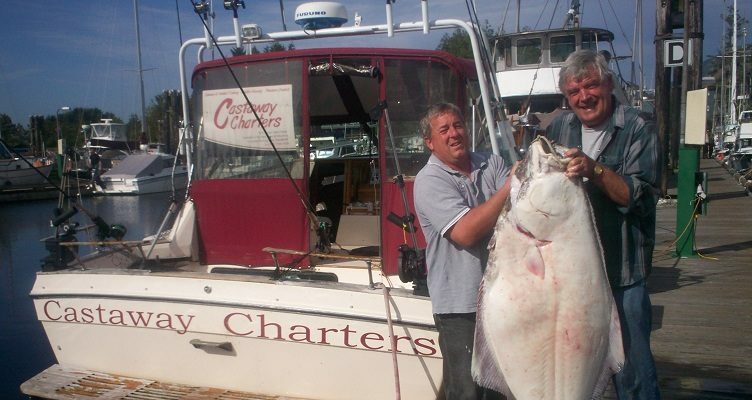 In 2013, a 14 year old customer reeled in a Halibut over 140lbs., and another reeled one in over 110lbs. Last year (2017) we caught another 150lb Halibut! Unfortunately for us, but great news for the fish, they all had to be released under the new fishing regulations. The customers were incredibly thrilled and couldn’t imagine how challenging these monstrous Halibut could be. Paul knows all the tricks to make your “Fishing Trip of a Lifetime” come true. Paul was awesome! So nice and friendly! Had such a fun time offshore fishing for my first time! Can’t wait to come back to fish with you!!!! 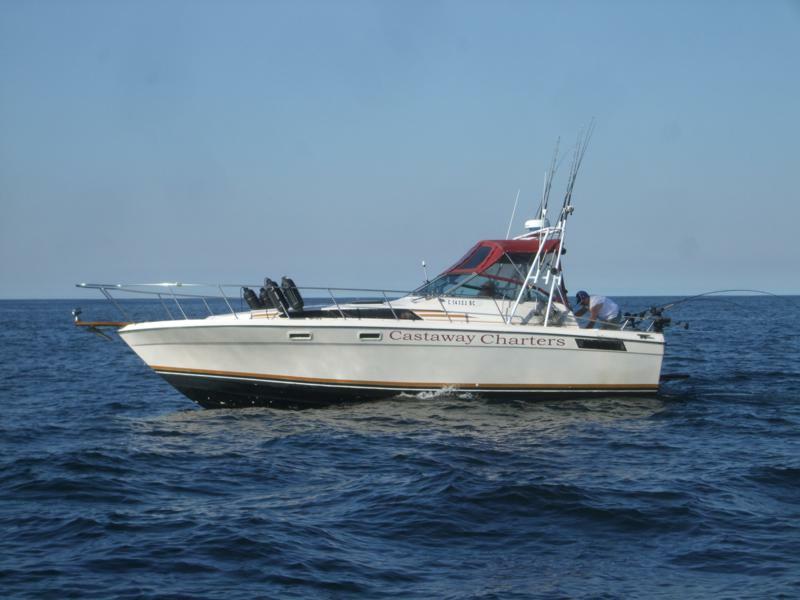 Enjoy all the conveniences and comforts of Castaway Charters’ 32 foot Sport Fish Model luxury yacht. The boat comes with a private full-sized washroom and electric fresh water flushing toilet. Full charters can comfortably hold up to 5 people. Castaway Charters has all the latest gear and technology to make sure your fishing trip will be the most successful it can be. We’re fully equipped with 10″ 6″rods and Shimano reels. Lure depths are controlled by Scotty’s new High Performance electric down-riggers. We can fish at any depth with a light line and fast retrieval, thus keeping the hooks in the water longer. Castaway is equipped with a Furuno Radar System so we can monitor approaching boats and natural obstacles – Safety First. Our top of the line Lowrance Fish Finder and GPS will help us pinpoint the most populated fishing spots. This state-of-the-art system allows us to find schools of Salmon and Halibut and stay on them while you continue to reel them in! Our new anchor system for Halibut allows us to sit, relax, and indulge in our goodies, while waiting for the giant Halibut that are about to come to us. Caught another 150lber in 2016, proving once again that the anchoring produces larger Halibut. Are You Ready For An Angling Adventure of A Lifetime?